The above image shows "Pusti Marg Na Panch Tatva". Grateful if these were explained and kindly illustrate any bhaav behind them. Jagdishbhai, loosely translation of "Pushtimarg na panch tatva" means five prominant elements of Pushtimarg. There is akirtan on this. Does anyone know it? If anyone can put it on web in this section, then we can analyse these elements and the reasons. there is a little uncertainty - do we see the five elements here ? On our left we see Shri Vitthalnathji, Shri Mahaprabhuji, in the centre we see Shri Thakorji and on the right we see Shri Yamunaji and someone else ? are all these "elements" that we see in this picture/chitra also described in the kirtan ? I am not sure in this regard. Ee lilla gaajo nitya nar ne nariji. I think the two swaroops on Thakorji's left (but our right hand side) are Shree Yamunaji, because both swaroops have kamal ni mala in the hasta. This swaroop is of Shri Gokulchandramaji, there is a goddess standing with Gokulchandramaji's swaroop. And the other swaroop is of Shri Yamunaji. Sorry i dont know the name of that goddess. Thank You for clarifying and supporting this with the kirtan. If the kirtan is relevant to this chitraji then, perhaps the "goddess" next to Shri Yamunaji is Shri Vraj Bhoomi ? - Then the vallabh kul are being represented by Shri Mahaprabhuji and Shri Gusaiji on the right of Shri Thakorji ? Why does it then appear that Shri Yamunaji is standing behind and not in front ? since she is the chouthu tattva, and Vraj Bhoomi being the fifth ? Nirupaji, it is possible that both are Shri Yamunaji, however its not logical. As you said, why have two swaroops of Shri Yamunaji in the same "seva" form. Unnatiji, the nice chitraji you have here is that of Shri Vitthalnathji, I think because of the way he is standing on his "aasan" with both his hands on his waist, the aasan is the brick which was offered to him by his great devotee, Pundarik/Pundalik. When a learned pandit named Batuklal of Kanoj was taking bath in the river Ganges, this Innate Form of Divine was entangled in his yellow coloured dhoti. Form He handed over that Divine Form to Shri Mahaprabhuji. This Divine Form is related to the divine sport of snatching away of the clothes of Gopis. Once upon a time Shri Mahaprabhuji was taking bath. 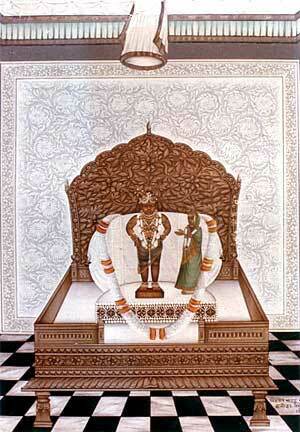 At that time, the images - forms of Shri Chhote Mathureshwarji and Shri Swaminiji were entangled in his sacred thread. Shri Swaminiji informed him of being Swaminiji of Shri Vitthalnath�s Innate Form of Divine. So Swaminiji shines graciously with Shri Vitthalnathji since that days. Shri Vitthalnathji was the supreme Form of devotion of Shri Harirayji. The name of Shri Gusainji as�Vitthalnathji� is related to this Innate Form of Divine. This Innate Form of Divine is lovely, beautiful and in standing position. One hand contains a conch with a hole, His other hand contains a lotus. His lotus-like feet contain ornaments. From toe-nail to waist, the colour is white, from waist to tuft, the colour is black. Shri VitthalNathji shone graciously at Kota since 1524 A.D. Shri Harirayji brought Shri Vitthalnathji to Khimnor. At present, The Innate Form of Divine Shines graciously at Nathdwara.